We hold far-reaching experience in the outdoor advertising and by which means we have successfully completed 1000+ branding venture, which has made us recognized as the top outdoor advertising company in Ahmedabad. Our experience is our strength, whilst brilliance in presenting every advertisement creatively is our passion. The Pole Kiosks Advertising Agency in Ahmedabad is an epitome of the same, pledge for making your brand considered through the theory of repetitive advertisement, wherein a mini billboard is accompanied with a pole to get the desired height and large coverage of the audiences. We believe the repetition of the same advertisement sequentially leaves a strong impact on the travelers mind rather than just getting noticed and hence suggests consumer for back to back in a row pole kiosk advertising in Ahmedabad. 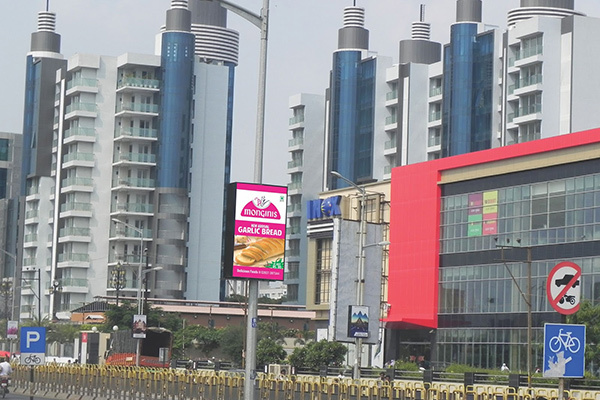 The purpose of combining kiosks with the pole is to reach a possibly highest audience in the busiest streets and provides excellent brand recall on customers’ mind through the repetition of the pole kiosks with the same message, has gained considerable appreciation in the Ahmedabad for its profitable outcomes. Our pole kiosk advertising in Ahmedabad has proven to be the smartest way to give your brand a hike by promoting in the busy street at a low price. Whether you are looking to advertise at malls, roads, airports or any other area, we have 10000+ locations in Ahmedabad to give your brand a successful lift at low cost.